The Battle of Bunker Hill on June 17, 1775 was an important mile stone in the American Revolution, yet many people do not know what happened that day or the role it played in the revolution. Journalist Thomas Fleming was given an assignment to do a one page feature on the battle. He became so interested that he wrote a book, first published 50 years ago. A recent reissue of the book has come out just in time for our annual celebration of independence. 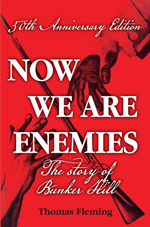 You may read the authors experience in writing the book on the George Mason University’s History News Network. A review of the book is available at American History Imprints. A review of the book and battle is available at The Free Library.